Cameta Camera is known to have the best deals on refurbished Nikon gear. 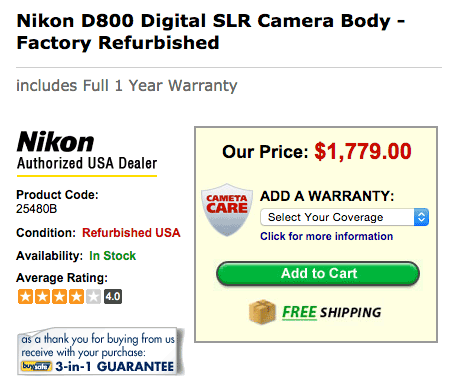 Today they have a refurbished Nikon D800 DSLR for $1,779 and free shipping! This is a Nikon US refurbished camera and comes with US warranty. Cameta Camera is an authorized Nikon US dealer. Check all of their refurbished listings here. Update: an even lower price on a refurbished Nikon D800 camera: $1,699.88. This entry was posted in Deals, Nikon D800 and tagged Refurbished. Bookmark the permalink. Trackbacks are closed, but you can post a comment.